appears at upper left, and was discovered on March 15, 1781 by Messier's colleague Pierre Méchain. M99, also cataloged as NGC 4254, was the second 'nebula' to be recognized as a spiral by Lord Rosse in the spring of 1846; a year after the discovery of his first spiral, M51 The Whirlpool galaxy. M99 has several normal looking arms, and one which extends to the left, that is less tightly wound. While the galaxy is one of the fainter Messier objects, it is a beautiful face-on spiral nonetheless! 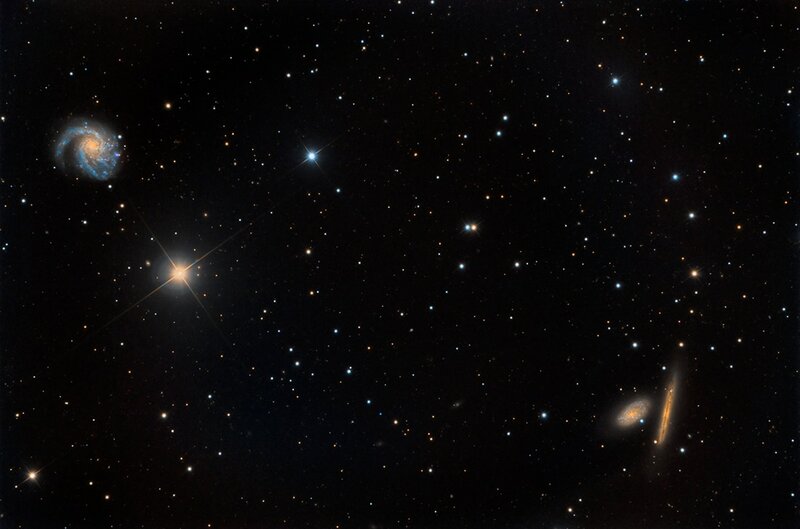 Though situated in the constellation Coma Berenices, it is a member of the Virgo Cluster. A type Sc spiral, it rotates clockwise and is unusually asymmetric, with its nucleus shifted off-center. In the lower right corner is the lovely galactic pairing of NGC 4298, a tightly wound spiral at left, and the edge-on NGC 4302 at right. Both are estimated to be 55,000,000 light-years distant.